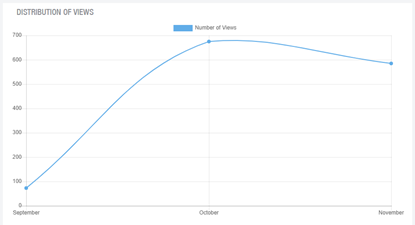 Total views along with hourly, weekly, and monthly breakdown. Average views (distribution of average views for a selected week or month over days/time slot that can help you identify the prime day and prime time). Distribution of views over time, days, weeks, and months. Location heatmap with a filter to select day, week, and month which can help you track the locations where you received maximum viewership. Metric for ROI – cost per view.